Today, August 13th, marks the centennial of women in the Corps. ﻿ The Marine Corps has a long and storied past with many milestones along the way. One major milestone came in 1918 when Opha Mae Johnson became the first female to enlist in the Marine Corps. 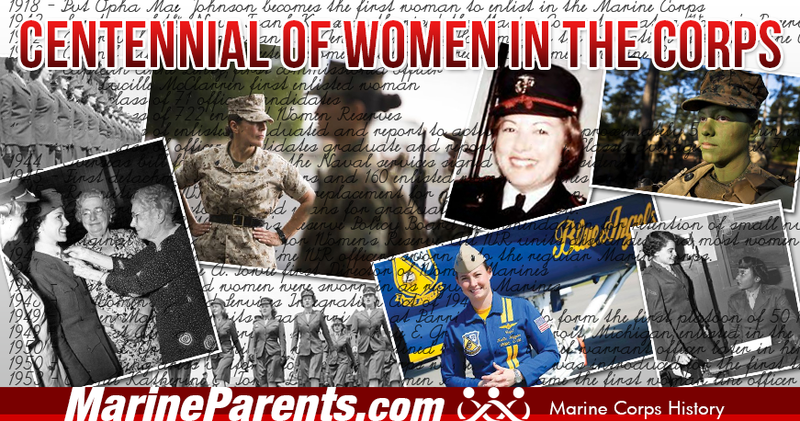 Since then there have been numerous events to occur that show the importance of women in the Marine Corps. In October of 1942, the Secretary of the Navy authorized the Marine Corps to create a Women's Reserve and accept applicants for commissions and enlistments. Colonel Ruth Cheney Streeter was named the first Director of Women Marine Reservists. Women in the Marine Corps are not only known for the barriers they broke down, but also for acts of bravery. In 1953 Staff Sergeant Barbara Olive Barnwell became the first female to be awarded the Navy and Marine Corps medal for saving a fellow Marine from drowning in the Atlantic Ocean in 1952. In 1949 the first African-American woman enlisted in the Marine Corps. Annie E. Graham of Detroit, Michigan was the first to enlist and the next day in New York City, Anne E. Lamb became the second. Both women reported to Parris Island on September 10, 1949 and went through boot camp together and were eventually stationed together at Headquarters Marine Corps. In 1965, Rose Franco became the first Hispanic woman to be promoted to Chief Warrant Officer. High levels of leadership are not uncommon for female Marines throughout history. There have been many high ranking female Marines over the years but there are a few that stand out specifically. In 1953, Ruth Wood and Lillian Hartley were the first women to enter the warrant officer program. In 1960, Geraldine M. Moran became the first female Marine promoted to E-9, Master Gunnery Sergeant. A year later Bertha Peters Billeb became the first female Marine to be promoted to E-9, Sergeant Major. 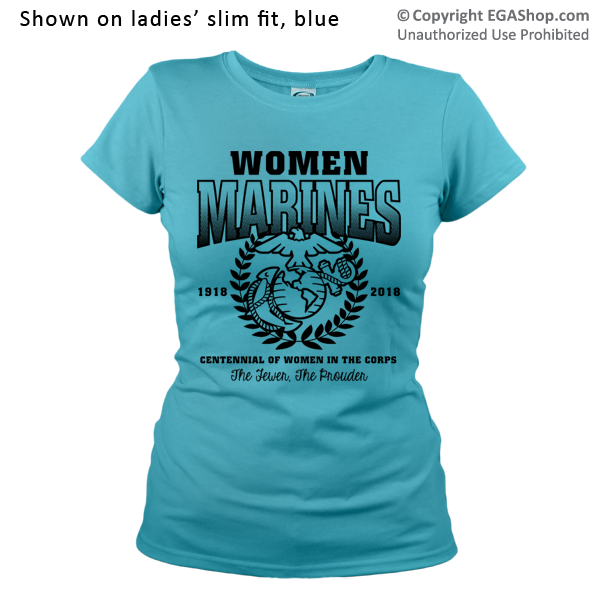 This design proudly celebrates the centennial of women in the Corps. Designed by the EGA Shop. Available in several colors and styles! 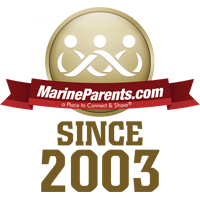 We are excited to be able to support the Women Marine's Association by donating items to their event on August 30th, 2018. Read our future newsletters to see a recap.